The preparation of nitric oxide (•NO) aqueous solutions and its standardization are of utmost importance to investigate the •NO bioactivity. 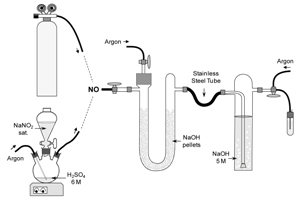 In this paper, we describe a detailed procedure for handling and purifying •NO gas, either from commercial cylinders or prepared from synthesis in the laboratory. Then, the standardization of the •NO stock solution, encompassing the titration with oxymyoglobin (OxyMb) in aerobic media followed by spectral deconvolution, is presented. The estimated molar absorptivity for OxyMb at 581 nm is ?eOxyMb 11.45±0.18 mM-1cm-1. The concentration of •NO measured in the stock solution (1.98 ± 0.15 mM) obtained from gas cylinder is in agreement with the theoretical values of •NO solubility in water. The comparison of the value obtained by this method with that provided by chemiluminescence and electrochemical sensors show similar results when the solutions under analysis are deaerated. Mixing artifacts from bolus additions of •NO to OxyHb are not apparent in the present study. The OxyMb assay also provides a valuable methodology for the determination of kinetic parameters of •NO donor decomposition, as shown by estimating the half-life of DEA/NO (12.6±1.4 min). Finally, the long-term stability of •NO stock solutions was also evaluated.